ASN.1 Complete teaches you everything you need to know about ASN.1-whether you're specifying a new protocol or implementing an existing one in a software or hardware development project. 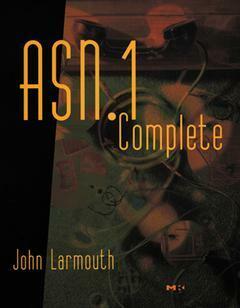 Inside, the author begins with an overview of ASN.1's most commonly encountered features, detailing and illustrating standard techniques for using them. He then goes on to apply the same practice-oriented approach to all of the notation's other features, providing you with an easy-to-navigate, truly comprehensive tutorial. The book also includes thorough documentation of both the Basic and the Packed Encoding Rules-indispensable coverage for anyone doing hand-encoding, and a valuable resource for anyone wanting a deeper understanding of how ASN.1 and ASN.1 tools work. The concluding section takes up the history of ASN.1, in terms of both the evolution of the notation itself and the role it has played in hundreds of protocols and thousands of applications developed since its inception. * Covers all the features-common and not so common-available to you when writing a protocol specification using ASN.1. * Teaches you to read, understand, and implement a specification written using ASN.1. * Explains how ASN.1 tools work and how to use them. * Contains hundreds of detailed examples, all verified using OSS's ASN.1 Tools package. * Considers ASN.1 in relation to other protocol specification standards. Engineers and programmers developing hardware products (cell phones, switches, internet appliances) that need to communicate with other hardware devices. John Larmouth was the Founding Director of the Information Technology Institute at the University of Salford, where he has worked for over twenty years. A graduate of Cambridge University, he has been involved with ASN.1 since its introduction as an ISO standard in the early 1980s. He served as Editor of the Standard for the first ten years of ASN.1's existence and has been ISO Rapporteur for ASN.1 for the past decade.